The Cloudera Navigator Metadata component allows you to add and modify the following custom metadata associated with entities: display name, description, tags, and user-defined name-value pairs. You can modify custom metadata using the Navigator Metadata UI, MapReduce service and job properties, Navigator metadata files, and the Navigator Metadata API. Click an entity link returned in the search. The metadata pane displays on the left and the lineage page displays on the right. In the top-right of the metadata pane, click . The Editing entity dialog box drops down. Note: You can specify special characters (for example, ". ", " ") in the name, but it will make searching for the entity more difficult as some characters collide with special characters in the search syntax. 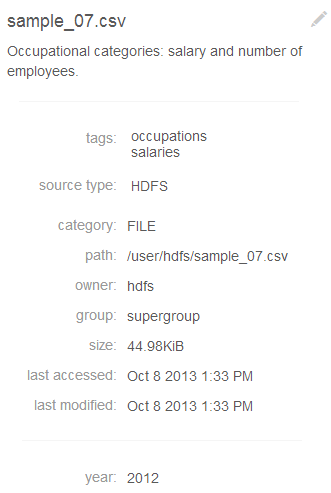 You can associate custom metadata with arbitrary configuration parameters for MapReduce jobs and job executions. The specific configuration parameters to be extracted by Navigator can be specified statically or dynamically. You can use the Cloudera Navigator API to modify the metadata of HDFS or Hive entities whether or not the entities have been extracted. If an entity has been extracted at the time the API is called, the metadata will be applied immediately. If the entity has not been extracted, you can preregister metadata which is then applied once the entity is extracted. Metadata is saved regardless of whether or not a matching entity is extracted, and Navigator does not perform any cleanup of unused metadata. If you have HDFS-1 and HDFS-2, you must specify the source that contains the entity you’re expecting for it to match. HDFS file or directory: fileSystemPath of the parent directory (do not provide this field if the entity being affected is the root directory). Example parentPath for /user/admin/input_dir: /user/admin. If you apply metadata to a directory, the metadata does not propagate to any files and folders in that directory. Hive table or view: Name of database containing this table or view. Example for table in default database: default. Hive column: database name/table/view name. Example for column in sample_07 table: default/sample_07. Hive database, table, view, or column: name of the database, table, view, or column. curl http://Navigator_Metadata_Server_host:port/api/v6/entities/e461de8de38511a3ac6740dd7d51b8d0 -u username:password -X PUT -H "Content-Type: application/json"
curl http://Navigator_Metadata_Server_host:port/api/v6/entities/ -u username:password -X POST -H "Content-Type: application/json"